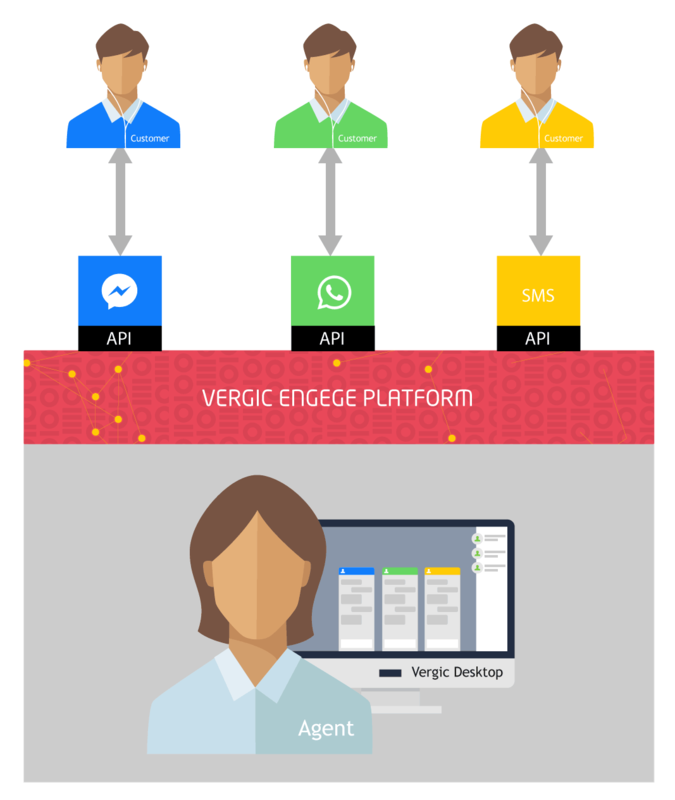 Vergic Engage supports both Web chat and External messaging (asynchronous) for a complete reach to your customers preferred communication channel. You can communicate direct on your website with your visitors OR in external channels as Facebook Messenger, Skype and HipChat. Vergic Engage support both online- and offline messaging with these technologies. NOTE: More IM channels will be added to this list in the coming months. This technology supports instant chat and video communication on your webpage trough Vergic Engage’s customisable chat client. When aiming for a “high first time resolution” or “contextual sale support”, “Web chat” takes in consideration the service agents availability. Web Chat is only offered when the right agent is online (but call- or mail back options can be offered if the agent is offline). With “web chat” both agent and a customer needs to be online at the same time. The advantage of this is that companies reach a quick resolution to the case, avoiding offline communication that tends to be more expensive. The key to Instant Messaging apps such as Facebook Messenger or Skype, is the asynchrony messaging technology together with our messaging API that allows a dialogue to span over a long time – online and offline. A site visitor can start a chat conversation through the company’s FB messaging profile OR from rule based proactive chat offers on the website. These proactive rules are configured in Vergic Engage to controll that you engage with the right person at the right time. A service agent will then answer once/if he is online. The service agent can also reply to a message days after the dialogue was initiated. A dialogue can live forever as long as there is an identifier such as a Facebook ID, phone number or any logged in profile ID. NOTE: Vergic also offers a framework for integrating Bots, with- or without artificial intelligence.